Seam Ripper and Thread Remover. New mini size- only 3.14" long. Comes in 3 assorted colors. 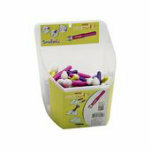 Innovative rubber thread remover on cap and bottom makes ripping seams and removing threads so easy. New, mini size is great for travel to classes and retreats.